When one hears that Kaiser Wilhelm did not appear when the Goethe Memorial in Berlin was unveiled, but turned up when the Wrangel Memorial was first presented to the public it might seem shocking, but it’s logical looking from the perspective of the German military monarchy. 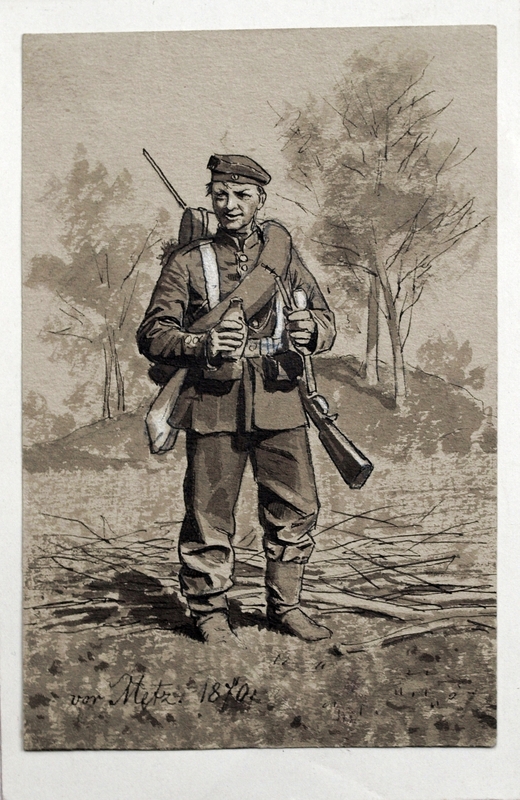 Wrangel, the old Puss in Boots, who always carried sweets in his pockets which he distributed to the children of Berlin, a crowd of which always “marched” behind him when he was walking the streets of the city. In Wrangel, the “old sabre”, with his babarian grammar and thick Prussian accent, lives the spirit of the old Prussian monarchy. When his son came into debt by gambling and faked his fathers signature on a certificate of debt he came to him and asked for his help. Old Wrangel answered: “You acted without honor, you are not my son anymore”. When his son asked what he was to do now, Wrangels answer was short: ” You own a pair of pistols”. The son shot himself. Frederick Count von Wrangel was born into an old baltic German, Swedish-Pommeranian officers family on the 13th of April 1784. In 1796, at the age of only 12 years, he joined the Prussian army as Fahnen-Junker (ensign) in Dragoner-Regiment “von Werther” Nr. 6 (Dragoons) getting promoted to the rank of Seconde-Lieutenant in 1798. During the campaign of 1806/1807 we find Wrangel and his regiment in the Battle of Eylau (7th & 8th of February 1807), subordinated to the Corps led by General l’Estocq. Leading the last operational unit in the Prussian army, L’Estocq was only able to bring eight battalions, twenty-eight squadrons, and two horse artillery batteries (estimated at 7,000-9,000 men) to the battle in which Wrangel distinguished himself as being a courageous and dashing Dragoon officer. Getting badly wounded by a sabre cut during the Battle of Heilsberg in June 1807, Wrangel was taken out of action for more than six months during which he was awarded the coveted Pour le Merite and the Russian Order of St. Vladimir 4th Class. In 1813/1814 Wrangel, now a major, was serving in the East Prussian Cuirassier Regiment (Ostpreussisches Kürrasier-Regiment, formerly Dragonerregiment „von Zieten“). 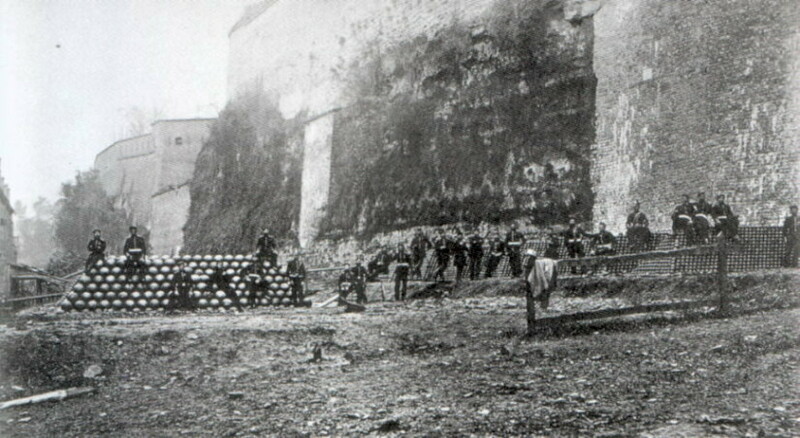 With this regiment he participated in the Blockade of Luxemburg, the Battles of Groß-Gröschen, Bautzen, Dresden, Kulm, Leipzig, Laon and Paris and a lot of smaller engagements i.e. Haynaut, Montmirail, Etoges, Champaubert, Gue a Trenne, La Ferte-Milon, Oulchy le Chateau, Sezanne and Claye. 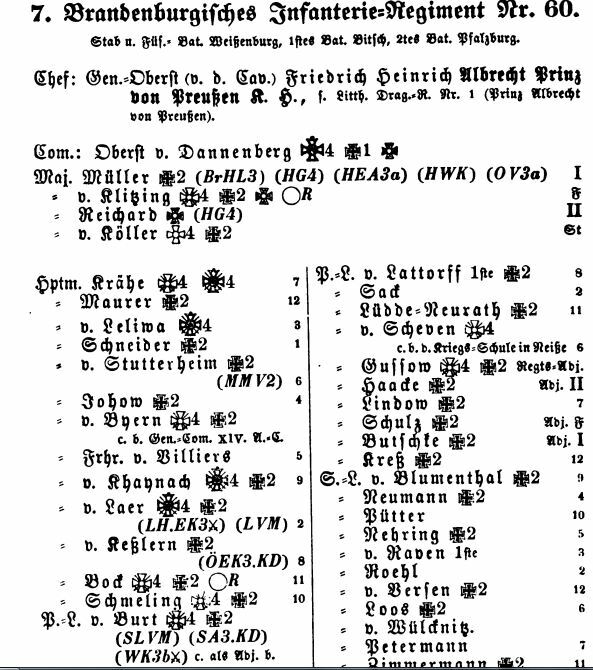 For his bravery in this impressive list of battles and skirmishes Wrangel was awarded the Iron Cross 2nd and 1st Class. On the 2nd of June 1814 he finally got his first regimental command, taking over the 2. Westpreussisches Dragoner Regiment (2nd West-Prussian Dragoons), and his rise through the ranks was continuing still. In 1837 we find Wrangel, now a General-Major in command of 13th Cavalry Division, suppressing civil risings in Münster, something he, as a stout conservative and fanatic royalist, most probably enjoyed. In 1839 he was serving as commanding General of I. Armee-Korps in Königsberg (Prussia) and in 1842 of II. Armee-Korps in Stettin. In 1848, the year of the German Revolution, Wrangel moved against revolutionary Berlin (10th of November). The Revolutionaries had threatened to hang Wrangels wife if he would lead his troops into the capital, but Wrangel was not the person to be unsettled by such threats. When passing the Brandenburg Gate (in those days marking the western boundaries of Berlin) at the head of his troops he is said to have remarked in thick Prussian dialect “I wonder if they have hanged her by now“. 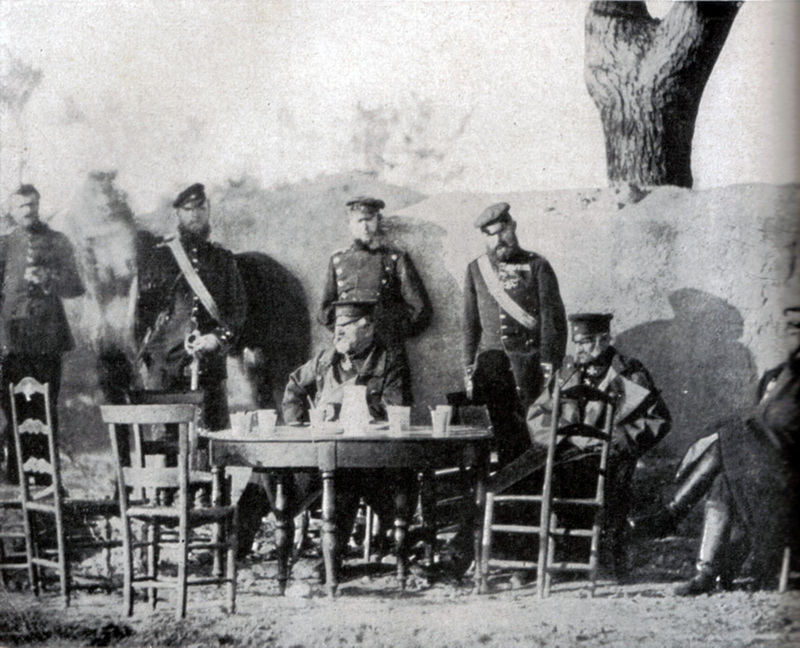 What followed was a short and harsh dispute with the commander of the civil militia Major Otto Rimpler in which both sides agreed that there was no need to shed blood. The militia was demobilized and disarmed, the assembly of the civil representatives in the Schauspielhaus was dissolved. On the 14th Wrangel declared the city to be under Martial Law. The Revolution was over and Frau von Wrangel was left unhanged and unharmed. In 1849, now a favourite of the Kaiser and a full General der Kavallerie, Wrangel was put in command of a Prussian corps fighting in the First Schleswig War. 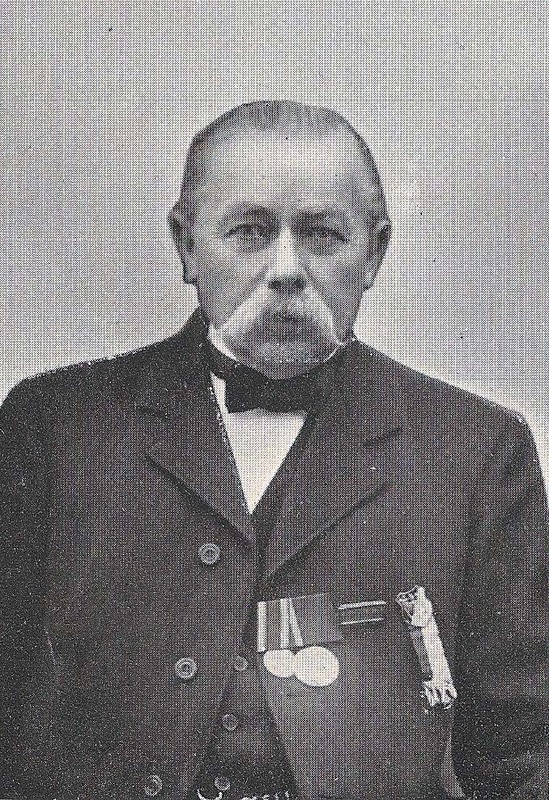 There he fought in the Battles of Schleswig, Oversee and Düppel (being awarded the Order of the Black Eagle for his services). 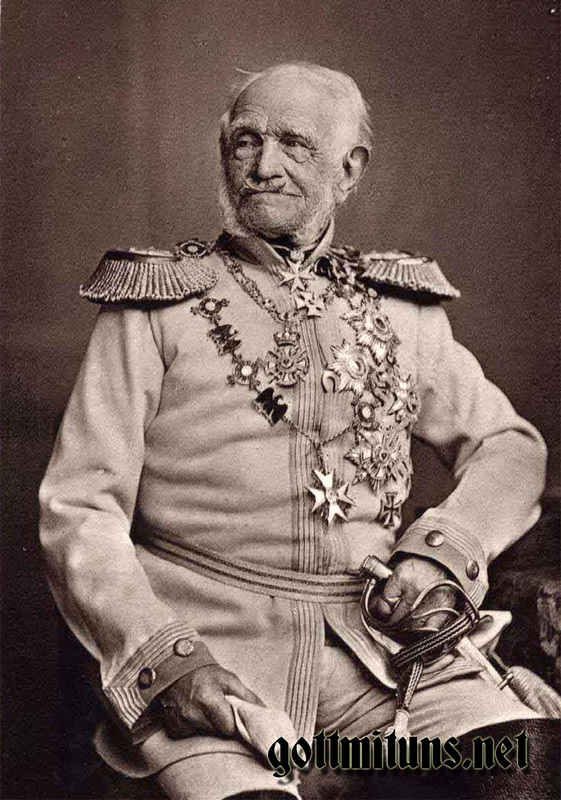 Having been promoted to the rank of Generalfeldmarschall in 1856, during the Second Schleswig War in 1864 Wrangel was appointed Commander in Chief of the allied Prussian and Austrian Armies. The problem was that the now eighty year old Wrangel was old for his years and, though popular with the conservatives at court, at best a mediocre general. All his recent combat experiences had been acquired in against civilian insurgents in the revolutions of 1848 and the short war of 1849. He never visited a war academy and all his fighting experiences were gained in the saddle, carrying a sword against the soldiers of Napoleon. While Wrangel lurched from blunder to blunder in Denmark, the Austrian units acquitted themselves with courage and skill. 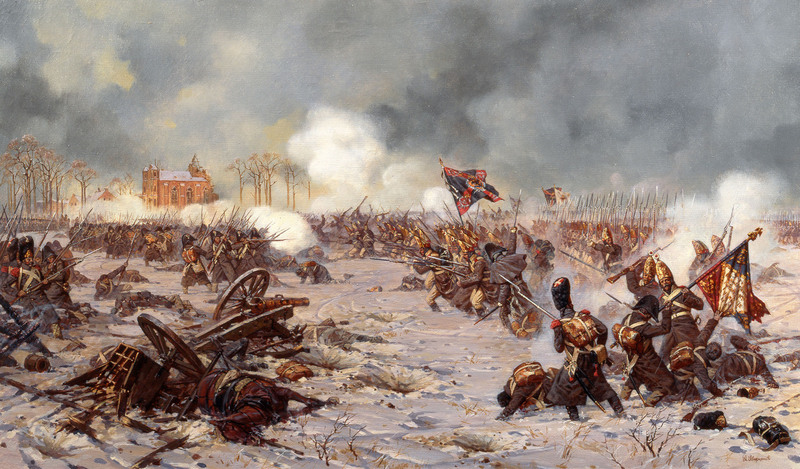 On 2 February 1864, one Austrian brigade charged and took the Danish positions at Ober-Selk with such panache that old Wrangel rushed to embrace and kiss the Austrian commander on the cheeks, much to the embarrassment of his Prussian brother officers. In mid-February, Wrangel sent an advance detachment of Guards north of the Jutland border despite instructions to the contrary. But Bismarck persuaded the war minister to send a sharp reprimand to the elderly general, and Wrangel was relieved of his command at Bismarck’s insistence in mid-May. The enraged Wrangel sent a dispatch to Berlin complaining about “certain Diplomats playing soldiers, who should be hanged at the gallows“. A deed for which he apologised to Bismarck after the wars end in October 1864. 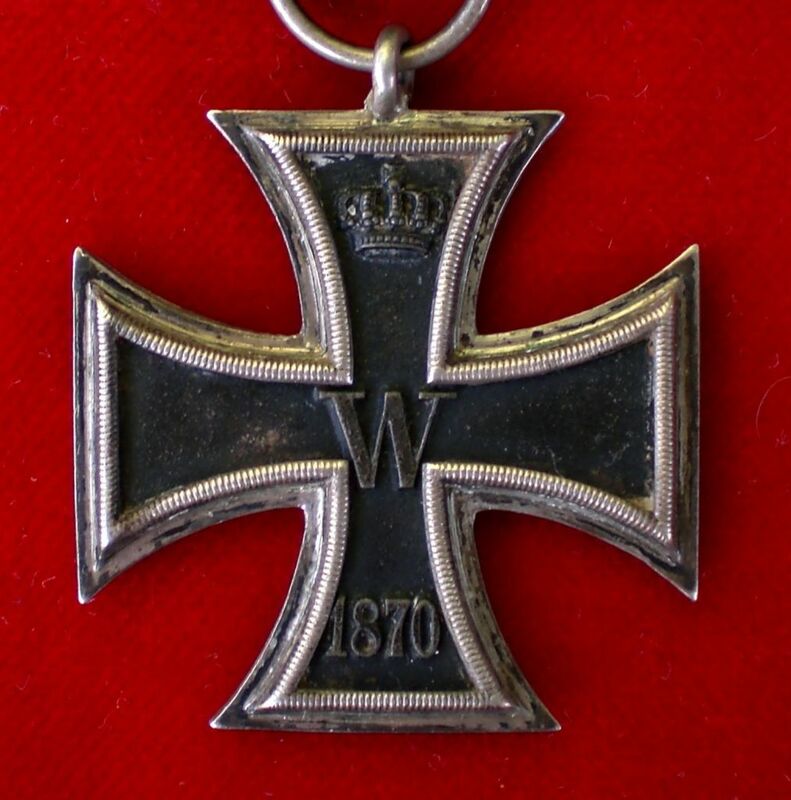 During the Austro-Prussian War of 1866 Wrangel joined his former regiment the Ostpreussisches Kürassier-Regiment Nr. 3 as an honorary officer and observer. He had become too old to join the actual fighting. 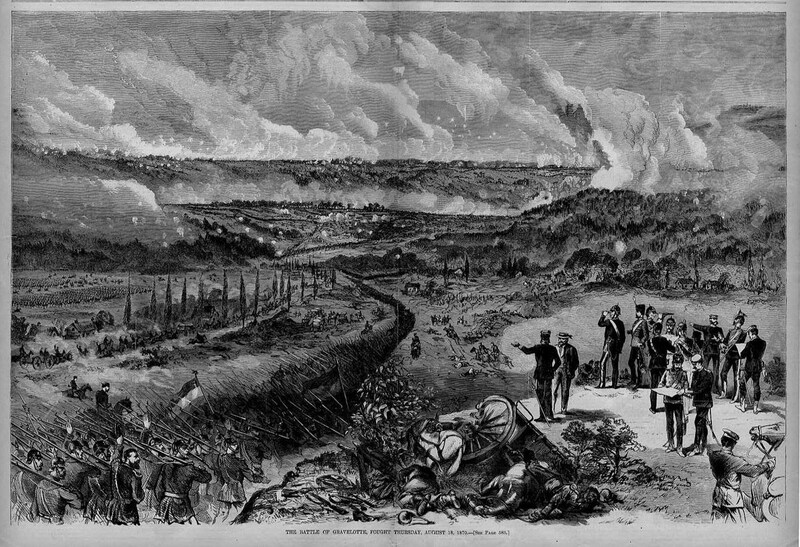 The same happened in the Franco-Prussian War of 1870-1871 in which he was given an honorary staff and was allowed to follow the Prussian Army in an observing role. After both wars and the victory parades that followed Wrangel was allowed to ride at the head of the victorious Prussian Army and in front of officers like Bismarck, Roon and Moltke which is a potent example of the popularity Wrangel enjoyed in Prussia. 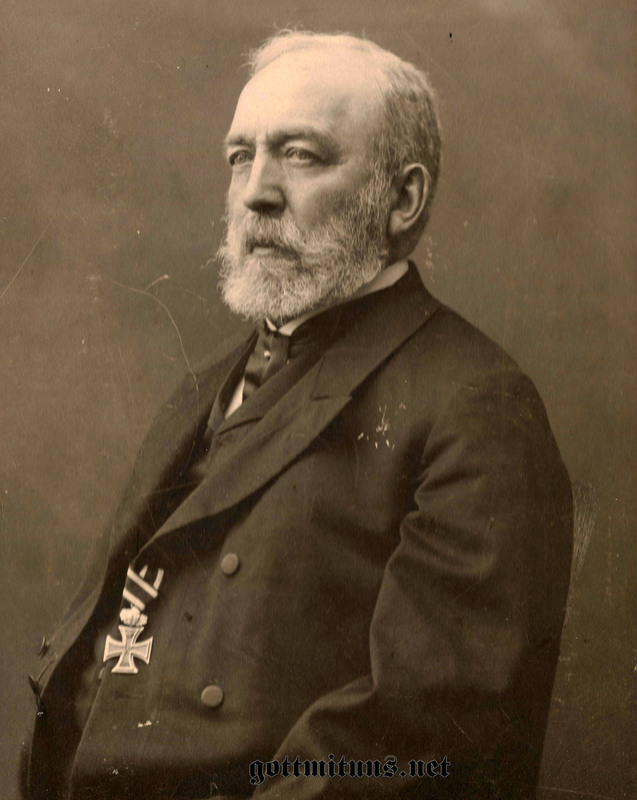 Wrangel died in Berlin in the year 1877, aged 93 years.